IN A remote province of Afghanistan that has been cut off by the country's worst winter for 15 years, The Daily Telegraph has found evidence suggesting the deaths of more than a thousand children in the last three weeks. The Telegraph accompanied three members of the Catholic Relief Service, the first international aid workers to gain access to the Tulak region of the mountainous province of Ghor since it was cut off, travelling on horseback and foot. Interviews from more than 20 valley villages across Tulak and neighbouring Shahak produced claims that an average of between five and 10 children per village have died in the past month. The villagers described a surge in respiratory diseases, exacerbated by food shortage and temperatures as low as minus 30 Celsius. "I have treated 160 patients in just two villages where 14 have died," said Dr Wahidullah Habibi, an Afghan doctor with Catholic Relief Service (CRS). "They have no food. Several people have frozen to death trying to borrow food from other villages. "We also have a lack of even the most basic knowledge on health issues and hygiene. They have no clothes for their children. "If we distributed all the medicine they need in those two villages we would have no medicine left within a week." There are 270 villages in Tulak and approximately 1,000 in the whole of Ghor, though with so many area. In Gar-e-Hasar, a village of 75 families just beyond the 9,000ft Janak Pass, villagers reported the deaths of seven children and six adults in the past month. On the night we arrived one of 13 ill children, a two-year-old girl named Bibi Gul, was expected to die from pneumonia. She was chronically underweight and her father said that, like other villagers, her diet was little other than bread and tea. Her mother stopped breast feeding her after one year because it was believed locally that it brought no benefit to the child. When we left she was still alive and showing slight signs of improvement with antibiotics provided by aid workers. Villagers in Dehan six miles away, where 80 households live, produced a list of 19 dead children. A series of low mud brick houses clinging to the barren slopes of the Gaw Kusht valley, it had no system of waste disposal and was surrounded by excrement. 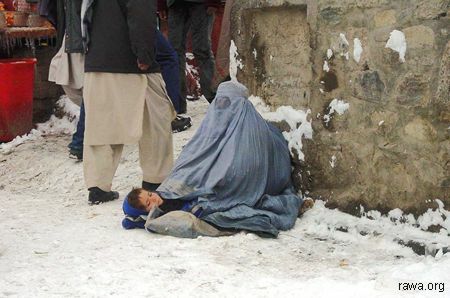 "My one-year-old son died 25 days ago," said Mullah Ahmed. He described how the boy's body turned black before he died, a symptom of pneumonia. The villagers said they travelled six hours a day to collect firewood. In some areas people claimed to have burned parts of their roofs for warmth and eaten their livestock and seeds for the coming year. The UN and the Afghan government have expressed scepticism at the figures being put forward for infant mortality in the province, suggesting there has been widespread exaggeration. "We go through agonies questioning whether the villagers may have exaggerated the figure of infant deaths because they believe that the number may be tied to aid," said Donal Reilly from CRS. "We have asked villagers on both sides of this valley and they are saying the same thing. We can only believe them. Our people are coming on too many funerals for this to be a big hoax." Officials in Tulak dismissed suggestions that villagers would lie about the deaths of children to attract aid money. Ghor remains all but unaffected by the billions of dollars of foreign aid poured into Afghanistan since 2001, locked in a near medieval state of development. When an aid agency vehicle reached a previously inaccessible valley in June, the villagers, who had never seen a car before, tried to feed it grass. For seven years the region has been hit by drought. On average Ghor's inhabitants are living on half to three quarters of their daily calorie requirement. "Twenty five years of war and then the drought has destroyed the infrastructure," said Haji Abdul Satir Khan, the governor of Tulak district. "Now we have suffered this terrible winter and no one has helped us." Aid workers blame the deaths on a lack of preparation after many mild winters, combined with the toll on people's immune systems caused by drought, poverty and lack of medical facilities.